The Continental Shelf along South Central Alaska, as seen on google earth. Continental shelves are parts of continents that are submerged under water. Continental shelves extend from the shore line to a steep drop off known as the shelf break. Water depth along the continental shelf averages about 200 feet or 60 meters. At the shelf break, at an average depth of 460 ft or 140 meters there is a steep drop off known as the continental slope. In just a few kilometers water depth may drop to depth of 12-15,000 feet or 4-5,000 meters. Widths of continental shelves vary widely. Passive (non-geologically active) margins tend to have broad shelves and gently sloping continental slopes. Broad continental shelves can be found spanning the Bering Sea, the South China Sea, the Gulf Coast of Florida, and New England. Active margins tend to have narrow shelves and steep continental slopes. 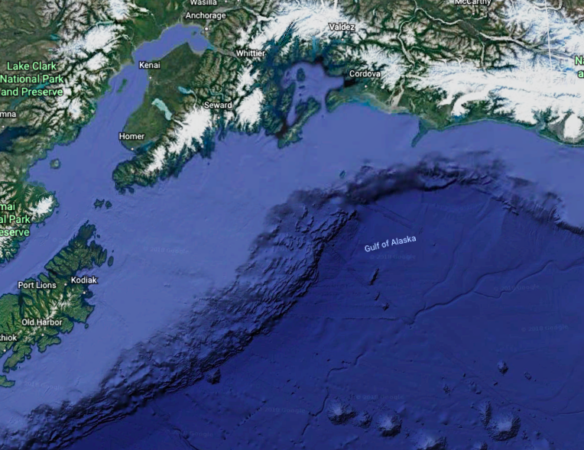 Active margins make up nearly all of the coastlines of the Pacific Ocean, including the West Coast of the United States, and the South Coast of Alaska. Sediments are inorganic debris that settles on the ocean floor. Sediment can be classified by by origin, i.e. where it comes from. There are four types: lithogenous, hydrogenous, biogenous and cosmogenous. Lithogenous sediments come from land via rivers, ice, wind and other processes. Biogenous sediments come from the mineralized skeletons of plankton and other organisms. Hydrogenous sediments are precipitated from chemical reactions in the water. Cosmogenous sediments come from space, filtering in through the atmosphere or carried to Earth on meteorites. Sediments can also be classified by size. Gravel is any material greater than 2 millimeters in its largest dimensions. Sand is any material between 2mm and 0.06 mm in size. Silt is material which is finer than sand, but still feels gritty when rubbed on your teeth. Clay is the finest material of all, and pure clay will feel smooth on your teeth, and will form a sticky ball when wet. Sediment is not distributed uniformly throughout the ocean. Not surprisingly, lithogenous sediments dominate the near shore areas of the continental shelf. Biogenous dominate the deeper areas of the ocean, because there is so little of other kinds of sediments but they are also common in near shore areas, particularly in the tropics. Ooze refers to deep-ocean sediment that is comprised of more than 30% biogenic material. Calcareous ooze is comprised mostly of plankton with calcium carbonate skeletons. Siliceous ooze is comprised mostly of plankton with silicon-based skeletons. Hydrogenous sediments make up only a very small portion of ocean sediments and are primarily found near geologically active areas. Most of the world’s living things live in the relatively shallow waters of the ocean’s continental shelf. It is easy to think of these organisms as being divided into three basic categories. Plankton are organisms that drift with currents close to the surface. Many are very small, but there are large examples as well. The Portuguese Man-o-war can grow to over 100 feet long. What makes a plankton is not the size, but whether or not you are at mercy to the flow of air and wind currents along the ocean’s surface. Nekton are organisms that are capable of swimming against currents. They can be found at a variety of depths, from shallow to deep. They move through the water column with ease and can be highly migratory. 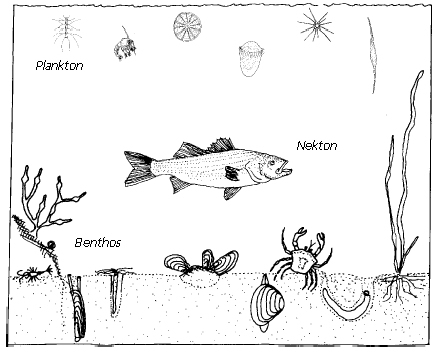 Benthos (or benthic) are organisms that live on the bottom. Some are capable of swimming, but most walk or slither instead of swim. Benthic communities vary greatly based on what is on the bottom. Roughly speaking, the bottom is either hard or soft. Hard, or rocky, bottoms are often rich with plant or coral life. These hard surfaces provide places for organisms to attach themselves. Soft bottoms are sandy, silty, or muddy. They are normally un-vegetated by plants or algae’s, but they are often rich with organisms burrowing or burying themselves in the sediment. Rocky bottoms are rich and productive places, often colonized by kelps and seaweed’s. They are home to many types of animals including; suspension feeding organisms (such as sponges and barnacles), grazers (such as urchins, chitons, limpets, and abalone), and carnivores (such as crabs, octopus, and fishes). In Alaska, rocky fjord walls are dominated by a variety of attached filter-feeding organisms that include corals, sea pens, sponges, sea anemones, barnacles, and mussels. Like all suspension feeders, these animals take water into their bodies and filter out detritus and dissolved organic matter. They make up the bottom layer of a food web that includes numerous species of shrimp, fish, and marine mammals. Any place with a hard surface to cling to, and provides a seasonally abundant food source, is considered prime habitat for kelps and seaweeds. Click to learn more about rocky bottoms. Unvegetated soft bottoms are often unstable, shifting constantly in response to waves, tides, and currents. They can include sandy bottoms and beaches as well as mud flats. These are difficult places for plants or kelp to grow. However, animals are abundant. The animals that live in these soft bottom communities, are classified as either epifauna (animals living on the surface) or infauna (animals living below the surface). Infauna can be further divided into suspension feeders or deposit feeders. Deposit feeders eat amongst the muck and mud on the bottom, and remove food material from the mud. Suspension feeders, such as this peacock worm, feed from the water column above them. There are three main types of sediments found on the ocean bottom. They are classified by their source of origin. Lithogenous or Terrigenous Sediments are inorganic, formed by the breakdown of rocks on land. Biogenous Sediments are organic, composed of the skeletons, shells, and decomposed remains of marine organisms. Biogenous sediments tend to be found close to the continental shelf. Click to read more about these different sediment types. Kelp is a generic term for accumulation of brown algae’s. If they do not form a surface canopy, they are called kelp beds, but if they do form a canopy, they are called kelp forests. Kelp forests have distinctive layers, each made up of species that grow at a characteristic height above the bottom. First is the canopy, where the fronds lie on the water surface or in mid-water. Next is the understory, where fronds are erect and stand above the bottom or lie directly upon it. 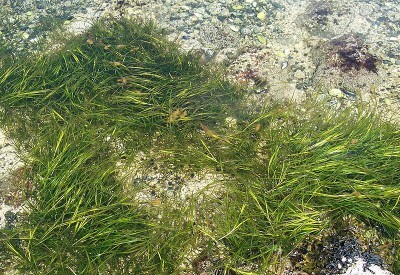 The final layer is the substrate upon which many algae lie down. Kelp forests communities are rich in species diversity, including a wide variety of invertebrates, cephelopods, fish, and sea birds. 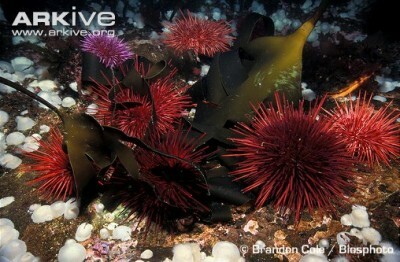 Sea urchins are one of the most important grazers of kelp forests and can be responsible for kelp forest destruction when their populations increase too much. Sea otters play key roles in regulating the abundance of sea urchins and, as such, act as a keystone species. Kelp attaches to the substrate (or hard bottom) via a holdfast, have a stemlike stipe, broad flat blades, and a float or pneumatocyst. 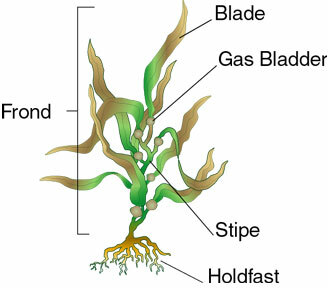 Fronds are defined as a stipe with many leaf-like blades. As always, your textbook may be used as a resource. For questions about life on the continental shelf, see chapter 13. Open the assignment Graphing the Continental Shelf. Follow the instructions to locate the depths of the transect lines used in the North Gulf of Alaska Long Term Ecological Research Project. Continue to follow the instructions that are part of the Graphing the Continental Shelf assignment to create a graph of the depths along the three transect lines. From the Graphing the Continental Shelf assignment, describe what the depths are like along the continental shelf. Describe how those depths change as you drop down the continental slope. From the Graphing the Continental Shelf assignment describe the differences in depth profiles between the three lines. Create a table that describes three (of the four) different types of sediments. In the table, identify where each type of sediment comes from and where each type of sediment can be found. Check out this map of ocean sediment thickness. Based on your observations, is ocean sediment thicker along the continental shelf or in the deep ocean? Explain why you answered the way you did. What does the word infauna mean? Describe an example of an infauna species. Explain the difference between a suspension feeder and a deposit feeder, and provide an example of each. 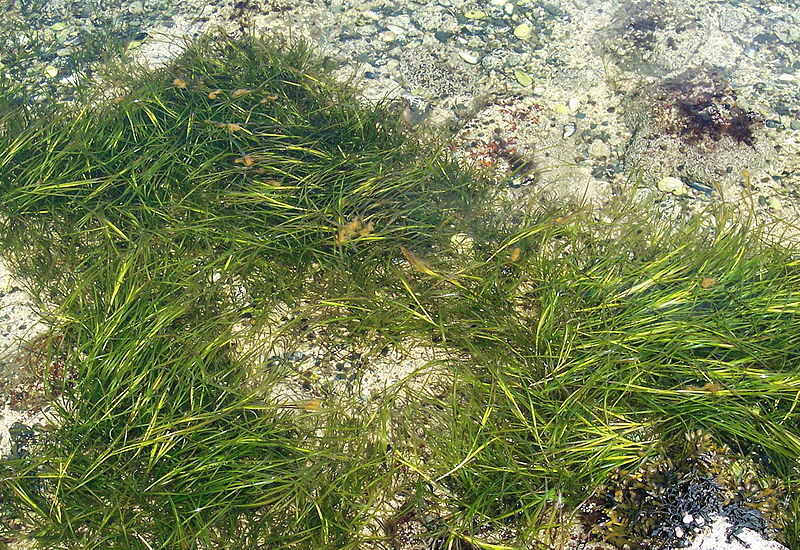 Explain one key ecological role that sea grass plays in the continental shelf. In your explanation, be sure to talk about photosynthesis, nutrients, or habitat. Describe what is happening to California’s kelp forests and what organisms are involved.